Algory Project, created by traders from the world’s largest exchanges, the US NYSE and NASDAQ, launches its ICO Whitelist on November 15th. It will provide investors in the cryptocurrency market with a comprehensive trading tool. It will make trading more efficient and your transactions will bring more profits. Algory Project is aimed at the users of the world’s largest cryptocurrency exchanges, a population estimated to be close to 30 million people trading on more than 100 exchanges. This versatile tool has one goal: to grow traders’ profits and efficiency in the cryptocurrency market. The tool is developed by professional and experienced traders from the world’s largest stock exchanges, the NYSE and NASDAQ, who have also been actively engaged in the cryptocurrency market for many years. Using their experience, they decided to transfer the proven methods of the stock exchange to this fast-growing market. Algory was created by Tomasz Przybycień and Dominik Gordel, who have been professionally engaged in trading on stock and cryptocurrency exchanges since 2007, and crypto-mining as well. The software will include 13 functions on one platform. This will enable traders to gain access to the tools described below and use them for trading in the cryptocurrency market. “Considering the development of and growth in the popularity of cryptocurrency exchanges, it is increasingly difficult to analyze all currency pairs in a short time. I have lacked tools that I use on a daily basis in stock markets, such as streamlining tools that make trading more effective as well as plenty of appropriately aggregated market data and news” – says Tomasz Przybycień when asked about the origin of the product. Algory’s flagship product. The first comprehensive cryptocurrency scanner on the market, which provides traders with instant cryptocurrency scanning based on specific filters and alerts. In the blink of an eye, the trader will find the hottest cryptocurrencies on the market. Based on hundreds of built-in filters and alerts, the user will be able to define events such as price changes, percentage increases and decreases, volume changes, and formulation of technical analysis or fundamental analysis indicators. What you used to do with your hard-earned research and many hours of work will now be done in an application within seconds. The resulting time advantage will allow the trader to enter into a transaction before any critical traffic is generated on a given cryptocurrency. Thanks to a wealth of active trading experience, the Algory founders know how crucial fast access to the most important information on the market is. Often, even a few seconds have been instrumental in generating above-average profits or protecting against sudden loss of value. Because we know how time-consuming it is to browse through the entire market, we are creating a tool that aggregates all the information about individual cryptocurrencies and the entire cryptocurrency industry. On the basis of this information, you will be able to filter this data and the built-in auto trading system will then allow you to enter into transactions at the time of appearance of specific news in the information sources of your choosing. The Algory database also contains historical data on price and volume changes and many other data on individual cryptocurrencies. In this way, you will be able to test your previous strategy with pre-defined filters and alerts. You will get a detailed report on how successful your trading strategy has been on the basis of the historical data and how likely you are to successfully use it in the future. Marcin Gordel, a software developer at Algory says: “Our goal is also to develop tools that will enable traders to see how successful a strategy was in the past in order to perform the appropriate simulations and evaluate its effectiveness. The knowledge about the profitability of a given strategy will certainly make trading easier”. In addition, the platform will allow you to use the auto-trading feature, so you won’t even have to be in front of your computer to be able to trade on the market based on predefined parameters. When a user-specified event is captured by the scanner, the auto-trading feature will kick in and automatically open a position. Algory Project plans to develop many other features that will allow you to access the widest amount of data aggregated in one place. The additional features will include the following: Blockchain Analyzer, Arbitrage scanner, ICO Viewer, Exchange comparison, Social Learning, Trading Room, Cryptoviewer, and Cryptocoin. 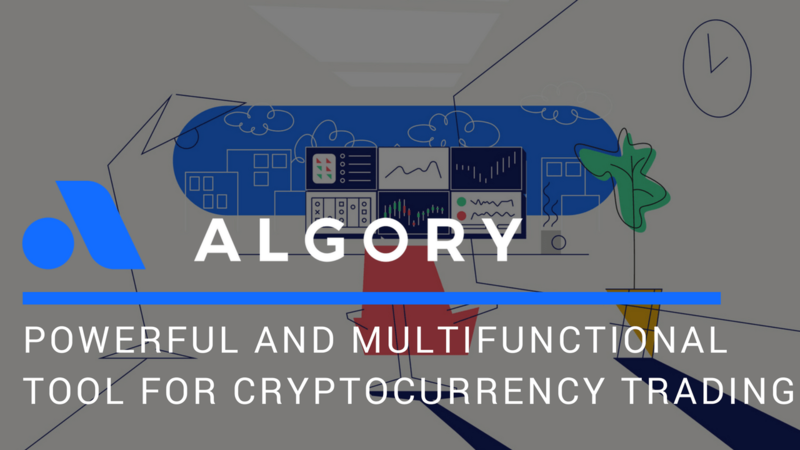 A detailed description of the functionality is available in the Whitepaper prepared by Algory Project. The signup to the Algory Project Whitelist opens on 15th November. Every person signed up to the Whitelist before the deadline becomes eligible for a guaranteed purchase of tokens before the public Crowdsale starts. Further details can be found on the Algory Project website.